and it was, well, not great! Not a total failure, but still have a ways to go. Preheat oven to 200˚F with rack in center. Place fruit in a bowl, and cover with the water. Microwave for 5 minutes to plump and soften. Drain, and reserve liquid. Place fruit in a food processor, add honey and process until mixture is very smooth and easily spreadable. If it is too thick, add some of the reserved cooking liquid. Cover two 10-by-15-inch baking sheets with plastic wrap. Divide puree between the sheets; spread in a thin, even layer with an offset spatula. Then sprinkle with seeds, optional. Let dry in oven until mixture is firm but slightly tacky, about 5 hours. 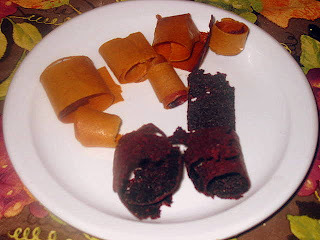 Peel fruit leather from plastic wrap, and cut into 1-inch-wide strips using a pizza cutter. Roll tightly into cylinders, and serve. Seems fairly simple, right? WELLLLLLLLLLL.....my first mistake was not reading this recipe correctly. Somehow, I totally missed the part that said DRIED fruit. Yeah, probably pretty important! I didn't notice it til I was putting this post together and cut the recipe from her page!! DUH!!!!!!!! So back to the baking: I used 1 cup each of two fruits we got last summer. I had peaches from our trip to Charlotte last July. Dad took us over to South Carolina to a fab peach stand and what the kids didn't eat, I cut up and froze. The other fruit I used was those yummy blueberries we picked in Watkinsville in July ~ yummmm! Once I had a thick puree, I spread each fruit seperately on half of a baking sheet lined with foil. Then I baked it at 150 degrees for 2 hours, then 200 degrees for 4 hours. It was still a little mushy in the center, so I ended up tossing some of it, but David and I cut it the rest into strips with the pizza cutter and rolled it up. The blueberries kind of separated and made a lacy, uneven leather. Next time they need to be pureed with another fruit - I may try a few other berries with them ~ strawberries, blackberries perhaps? The peach leather is beautiful! The ends have a blue-ish tint from the blueberry puree next to them during the drying. David said they are both delicious, and he is taking them for snack today at school. I only got a couple strips out of this batch due to the soggy middle, but I will try again soon!! Lessons learned - read the directions completely!! I would use the same recipe, but less water, no soaking, and definitely cook at 200 degrees the entire time. I am going to be checking out goodwill and craigslist for a food dehydrator, too! !